Walsine Pierce: THE MUM FESTIVAL: Another way to celebrate! 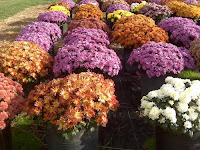 Barberton, Ohio has a mum festival each fall. It is difficult to believe the artful way mums are displayed or the beauty of the gardens. We drive by the gardens quite often but normally do not go to the festival. It is free but from the food to crafts, everything costs. The lovely mums are for sale fairly cheap at $5 each or 6 for $25. I have a long standing quarrel with the city over their spring tulips or fall mums. They cut down 12, centuries-old oak and maple trees to make room for the flowers. A few years ago they stopped planting the tulips. People come from long distances to enjoy the festival and view the mums so I am in a minority in my quarrel I guess. I'm really out of touch because to my dismay last year they added a statue of the cities founding father and removed the WWI cannon. From the Cherry Blossom Festival to the Craft Shows, there are many events around Lake Anna which is a block from our home. Our street is full of cars for the days of the events. In addition to the parking we supply chairs, blankets, sweaters and jackets, water, bath room priveleges, food and a place to rest to extended family and friends. We don't mind. While we personally do not go to the events we share the experiences with those who come and go. Today some of our dearest friends, Renee and Marty with husband Ed parked their two cars in front of the house while they went to the festival. When they came back from the festival they all went somewhere else in one car leaving Renee's new car. Someone, I can't quite recall who, said wouldn't it be fun to T-P Renee's car. Although they both giggled and said what a "terrible thing to do", Julie and neighbor Donna headed for the car when the toilet paper appeared. It was childish and fun. Neighbors came out to watch and comment. People driving by slowed down and laughed. You don't see a T-Ped car every day. How funny when Rennee returned. I can't imagine why she would think such a thing but she immediately blamed me without a shred of evidence. Well, I am innocent. If you don't believe me just ask and I'll tell you. I AM INNOCENT! Look, you can see the pictures of the guilty parties. Now, while I do not enjoy the carnival atmosphere of the festival, I do love the sauage sandwiches. I told Julie she should go get me one. Somehow she thought that as we went to dinner on Friday and again on Saturday that we shouldn't get sausage sandwiches on Sunday. I don't get it but what can I say? She did make me a kibalsie with sauerkraut and mustard sandwich so I guess I should count my blessings. The moral of this story? Bad people live on 5th St. NW Barberton. Avoid the area if at all possible! When I was young we had to entertain ourselves; thank goodness we didn't have a TV. This story made me laugh, which, I needed! Thanks! Sounds like you guys have way too much fun in Barberton! Yup! Fun & Games. What can I say? Like your new picture. Couldn't make it larger? SEE YA SOON!